John Roach has a National Geographic News report (05jn23) Chickadees Use Complex Calls for Predator 911 talking about how these common small birds say their ‘chick-a-dee’ in different ways to help avoid predators and other dangers. Good thing they don’t talk like chickens. When the flock in the back yard gets a fright, the barking dogs get totally drowned out! A photo gallery has been posted in US 50 Destinations showing the Toquima Range and the towns of Belmont and Manhattan. The four hour tour went from the Big Smokey Valley up Moore’s Creek Road to Monitor Valley and then around the southern end of the Toquima Range back to the Big Smokey Valley. Get a bunch of Airstream enthusiasts together and a lot of things get discussed. Randy found out that a few hours of FantastiFan plus a few hours of DVD and TV plus some lighting meant dead batteries in the morning when a bit of furnance would have been nice. Thankfully a Honda 2000si came to the rescue. 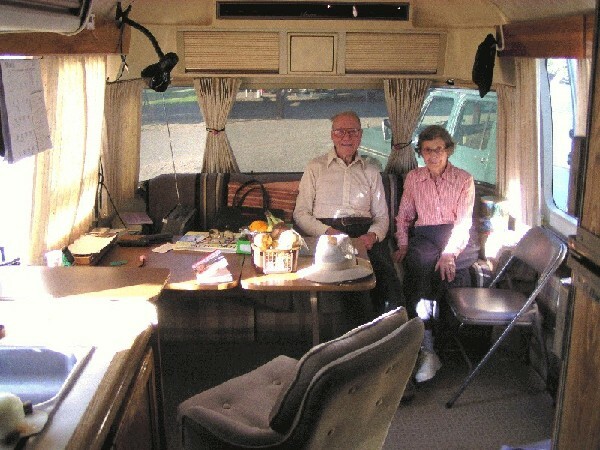 Jerry noted that the owner’s manual for the new trailers said the converters had some battery charging smarts. Older versions only provided a ‘float’ voltage of about 13.5 volts. The new ones are supposed to go up to 14.4 volts to charge the battery and then drop down to a safe float voltage. The smarts mean that it takes a lot less time to charge the battery or that the normal 3 or 4 hour battery charging session will be a lot more effective at bringing the battery up to snuff. Don noted that batteries in good condition weren’t as suceptible to water loss as old batteries in poor condition when left on the converter for a couple of weeks. The higher the voltage over about 13.2v the faster the likelyhood of water loss in the battery over time. Jerry also showed a nice fairly short twistlock to 15 amp umbilical he made to connect his trailer to a typical house circuit. The usual 30 amp to 15 amp dongle is another thing to carry around and adds two more plugs as a sources of potential failure. The ground wasn’t sloped a lot but most rigs needed some leveling. Pulling a wheel up on a 4×6 block only worked because the block sank into the ground a half inch or so which prevented it from sliding. Smaller blocks stacked worked OK, too. Lynx Levelers were also used. The wind limited awning use. A staked down and tied down screen tent even had to be taken down Saturday evening else it would have been on its way across the valley along with anything else loose. 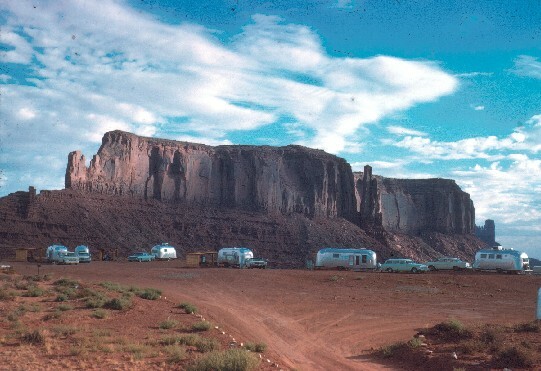 The Airstream tours also had a wide variety from the Root’s 1953 (?) 26 footer to Virginia’s 1991 B-Van to the new rigs. Look for picture galleries to be announced when they get posted! Airstream, 1951 Crussette is a gallery of pictures of an early model Airstream in near original configuration. Photos by Rich Jaggard. SFGate reports that Tioga Pass, route 120 over the Sierra’s and through Yosemite, has opened for the season although many campsites along the route remain closed. Services along the Highway 120, also known as Tioga Road in the park, and in Tuolumne Meadows will be limited. All campgrounds along the Tioga Road corridor and the Tuolumne Meadows Campground will remain closed until further notice. This is one of four highway routes across the High Sierra that close in winter. These are the routes you generally want to avoid in a large RV at any time. Tioga is on of the tamest of these but still requires careful attention to grades and curves and good mountian driving skills. To get over the Sierra’s, use Ca 88, US 50 or I80 unless you know the road and its risks. Nanci Hellmich describes ‘Portion distortion’ in USA Today (04jn22). Studies show that the more food put in front of people, the more they eat. And since the 1960s, the serving sizes of foods sold in stores and restaurants — from candy bars to burgers and sodas — have become much bigger, Young says. Rather than cutting carbs, fats or proteins, Young says Americans should “smartsize” their portions. She recommends using visual images to become aware of how much you’re eating. For instance, a 3-ounce serving of meat is the size of your palm or a deck of cards. One key to personal fitness is to maintain an appropriate intake. Develop the habit of leaving something behind or splitting entrees when dining out. Just sample at the pot luck and don’t go back for seconds. An occasional splurge won’t do any damage but bad habits will. Make it a habit to moderate your food intake. This is a time of plenty of food in an astounding variety that is nearly always in front of your eyes. Enjoy and sample. Don’t let the cornucopia overcome your sensibilities! See the Owner’s Guide sections on diet and exercise. Summer officially arrives at 2:46 a.m. EDT on June 21 (11:46 p.m. on June 20 for those living in the Pacific Time Zone). And as darkness falls this week, the famous “Summer Triangle” can be found low in the eastern sky. Hear of the “summer triangle?” Wonder where this description came from?” Joe Rao finds out in Doorstep Astronomy: The Summer Triangle (SPACE.com 05jn20). Mosquitos – don’t bite me! The Urban Legends page Repel Tell takes on the Legend: Home remedies to repel mosquitoes are effective ways to defend yourself from West Nile Virus and answers with the Status: False. A University of Florida Extension Service report (PDF) provides another answer to what will keep the bugs at bay. The only real answer of any effectiveness seems to be DEET. When you are looking for a mosquito repellent, look for this as a major component. Some of the more popular products have up to nearly 25% DEET. Products for kids will have 10% or less. Washoe County Sentinal Flock is photo gallery showing what a county health department does to monitor mosquito born disease. 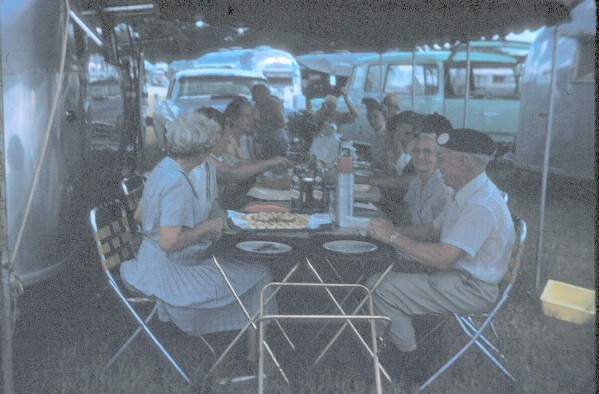 1959 Airstream Rallies in Wisconsin Dell’s and Hershey PA photo gallery is up in the Harrison’s Travelogues -|- fifties collection. A lot of good times, good scenery, parades, and good friends. The Kingston visit is planned for 23-26 June. On Friday, some folks will take a ride over the Berlin to visit the ghost town and state park. Here are some links to provide background on the area. If you know of other good relevant websites, please email them (link at top right) so we can update this entry. Nevada Observer description of the town, its environs, and its attractions. (04AG9) It has about 100 residents, mostly retirees, and a golf course and RV park are just a few miles down the road. 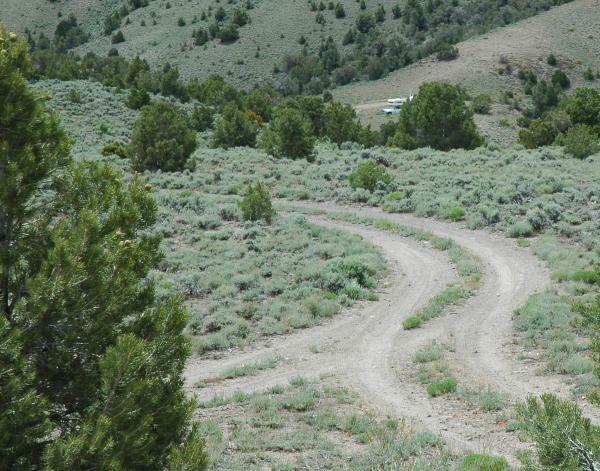 Arc Dome Wilderness Area – the KNPB Wild Nevada page on this location. There are very few canyons in any mountain range that can be driven into from either end, but Kingston Canyon is one of them. It opens into Smoky Valley from the eastern flank of the Toiyabe Mountains, so that is the obvious approach, but it can also be entered over the top from the upper end via Big Creek Road. This would be the scenic route. The steep grade near the crest, as a matter of fact, gets so darn scenic it makes some travelers queasy. Here’s a travel log from some Airstreamers who discovered Kingston – Discover Nevada Trip (June,1999 Bing, Betty, Kim, “Good ol’ Boy” and the “Silver Bullet”) – lots of pictures. Ray Browning, a doctoral student in CU-Boulder’s integrative physiology department and lead author on the new study, said the results show that people who walk a mile at a leisurely pace burn more calories than if they walk a mile at their normal pace. In addition, those who walk at 2 miles per hour rather than 3 miles per hour reduce the loads on their knee joints by up to 25 percent. “The message is that by walking more slowly, obese individuals can burn more calories per mile and may reduce the risk of arthritis or joint injury,” he said. Because walking slowly may not significantly improve an obese person’s level of cardiovascular fitness, performing other vigorous lower-impact activities like swimming, cycling, step routines and elliptical training workouts also are recommended, said Browning. The original press release is online. This says that your stroll around the campground to see what other rigs look like and what else is happening doesn’t have to be in a big hurry. Take your time and smell the roses. A good half hour or more of being out and about, even at a leisurely pace is good for you. One in three individuals over the age of 65 will fall in the next year. One fall in 200 will result in a broken hip. One-half of seniors who break a hip never regain their full degree of mobility, and one-quarter die within six months. Falls account for $26 billion in medical costs each year. Graduate engineering students working with Thomas Andriacchi, professor of mechanical engineering and orthopedic surgery, recently developed a “smart” ankle brace for the elderly to correct imbalances and prevent falling. The Stanford Biodesign Innovation Program sponsored the interdisciplinary project. 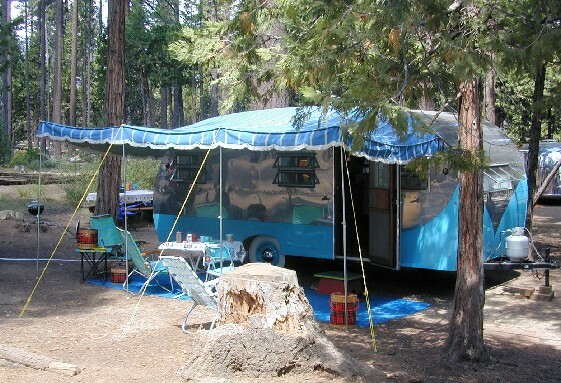 There was a rally of vintage RV’s at Camp Richardson near Lake Tahoe in 2004. Here is a photo gallery. A Wired report Grand Theft Auto Meets Robocop describes an Italian developed automatic license plate reader that police can use to identify stolen vehicles. Looking like a foot-long, aluminum teardrop bolted to a patrol car’s light bar, the Mobile Plate Hunter contains two infrared cameras that can read between 500 and 800 plates an hour, the manufacturer said. So, if you see one of these on a cop’s cruiser in your neighborhood, you know license plates are being checked against a database of stolen cars. While the robot is checking license plates, the cop inside the patrol car can be paying attention to driving and other duties. New on the commerce page: 1984 Airstream 29ft Sovereign – for sale. See the photo gallery. For Sale – 1984 29 foot Soverign Airstream Trailer. $13,995 Rear twin beds, center bath, larger Dometic refrigerator installed in 2004, original owner. The paint is peeling some on top. Owner says he had it serviced regularly, and kept it clean and waxed. It has two solar panels, heavier duty shocks, light truck tires, catalytic heater, and a short wave radio (he installed that to use as a telephone before cell phones became available). The curtains have all been replaced, and all woodwork has been refinished. Email: hq@SierraNevadaAirstreams.org for contact information. Its been a wonderful trip but now is time to move on to other things. The 2005 Reno Rodeo Cattle Drive is arriving in Reno. Check out events, happenings, schedules, tickets, and what’s up at the Reno Rodeo website. Check out the pictures from 2000. See what stories the local paper thinks are worth reporting. So, if you need a reason to join the WBCCI or other RV club that gets people together and makes new friendships, consider this study. The relationships you make, the new friends who share your interests, may help you live a longer, healthier, and happier life. The Inquirer reports that Kodak axes production of black and white paper. If there is anyone left who has their own chemical darkroom to process film and make prints, they are going to have to find other sources for their materials. And on a different topic, if you are into Batman, Slashdot noted a How Stuff Works article on Batman’s suit. This is how an intelligent, educated, standard human can become a super hero crime fighter. He has good tools! Harrison’s Travelog photo gallery of rallies in the Four Corner’s area in 1962 is up!